Job application is one tough and challenging process. Just as every soldier prior entering a vast battlefield, necessary equipment must be prepared. This applies to you and the rest of the job applicants out there, and one essential tool that you should always have in hand is your curriculum vitae. A curriculum vitae (CV) is a written outline of a person’s experience and other qualifications for a job position. This is usually the primary item that a hiring manager sees regarding the job applicant. A CV is also often used in screening applicants which are then followed by an interview. To suffice this, a CV template is necessary. When composing your CV, make sure you have these details. These are essential that’ll make your CV more effective. Contact Details – This is the section where you’ll add your address, contact number, and active email address. Take note that using of an unprofessional email address is highly discouraged. Employment History – Focus on the responsibilities and tasks that show off your strengths and skills. Choose only what is relevant to your application. This will tailor-fit your CV to the job you’re applying for. Experience(s) – In case you don’t have enough work experience, you can think of other things that you’re involved in the past. Examples are school clubs, training, or volunteering services. List of References – You can have at least 2 to 3 character references. Make sure that these are not related to you by blood. Also, remember to ask your referees if it’s fine to add them. This way, they’ll expect someone to be in contact. Grammar and Spelling – Always check this before sending or giving off your CV. Avoid any grammar and spelling mistakes. 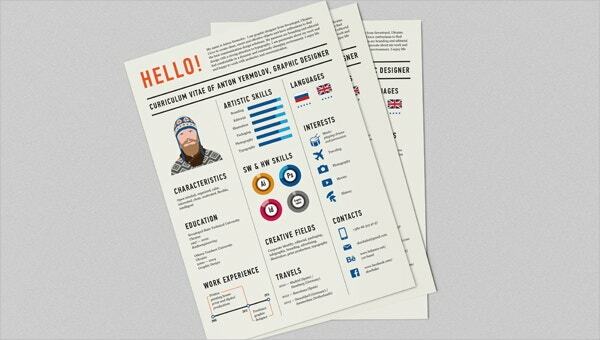 If you want sample images for your CV crafting, you might want to see our CV format templates. These are well-written and format-ready CV templates. For you to know what are the things you need to and don’t need to include, just refer the details below. Always make your CV engaging. For you to compare, you might want to view how others construct their CV. You can also ask your professors and friends for samples, or you can directly see our curriculum vitae samples. Begin you CV with information, such as contact information, name, address, email address, and so on. If you have a website, you may also include it. Check your CV for any typographical errors. Use bullet points, italics, or bold font only casually and make use of white or neutral color. Don’t rely too much on yourself if it’s the first time you’re making it. You may seek assistance from others, like your professors, colleagues, or advisers. Don’t worry about the length. Just focus on making your CV professional and that it contains relevant details. Don’t try to be funny. There is no place for jokes on a CV. Remember this is a business document and must be presented as such. Keep these things in mind and for sure, employers will see you as a potential candidate for the job. You can check out our curriculum vitae for an outstanding CV.